Can you ever get tired of potatoes? No, you firmly say, and I would agree. Sometimes, however, a fluffy-creamy-comforting side dish is called for, and potatoes (shocker) just don’t do the trick. Usually it’s simply a menu issue, meaning potatoes are not a perfect match to the main dish. Think shellfish, for instance, such as scallops or shrimp. Or a cuisine that doesn’t traditionally include potatoes. Step in, cauliflower. There’s something a little magical about this gnarly crucifer. Eaten raw, its flavor is pronounced in an earthy, grassy, unmistakably cruciferous way. When steamed, it transforms into something else, morphing into a buttery, milder version of itself – slightly sweet, a little fresh, and beautifully enhanced with, yes, butter. When roasted, it becomes something else entirely, evoking adjectives which include caramelized, nutty, and crisp. 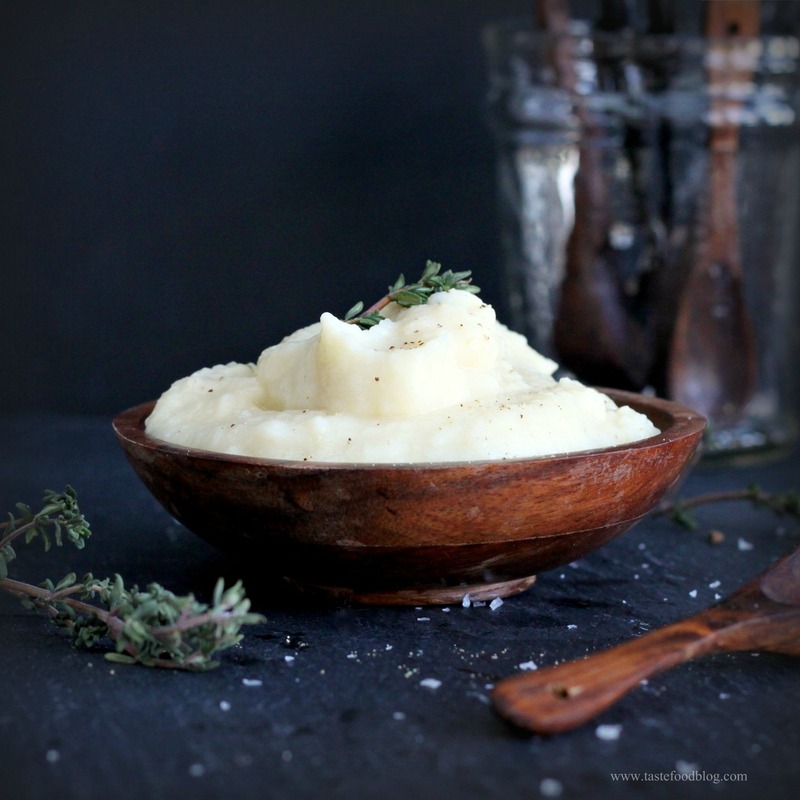 I made this puree recently to accompany a dinner of slow-cooked lamb. It goes equally well with just about anything. The chicken stock adds great flavor to the purée. If you prefer a vegetarian version, substitute vegetable stock. Alternatively, you can use water, but adjust the seasoning accordingly. Place the cauliflower and chicken stock in a large pot. Bring the stock to a boil, then reduce the heat and simmer until the cauliflower is very tender, about 20 minutes. With a slotted spoon, transfer the cauliflower to the bowl of a food processor. Add 1/4 cup of the chicken stock and process until smooth. Add the cheese, butter, garlic, salt, and pepper and process to blend. If the purée is too thick, thin with additional spoonfuls of the stock to your desired consistency. Serve garnished with fresh thyme leaves and extra black pepper. If one vegetable symbolizes Fall and Thanksgiving, it’s the Brussels sprout. When these little crucifers appear in the market, it means it’s time to pull on our sweaters and plan our holiday menus. Yet, if one vegetable symbolizes dinner challenges, it’s also the Brussels sprout, because when these mini-cabbages appear on the table you can be sure they will elicit strong reactions from those who love them – and those who hate them. Hence the eternal question: in the spirit of holiday togetherness, how can we serve these hardy sprouts for everyone to enjoy? This recipe might be the answer. Like all traditions that bear repeating, it’s worth sharing once again. It has a few simple techniques that may, just may, win over any steadfast sprout-hater. The trick is to roast the Brussels sprouts, which softens their assertive and firm cabbagey properties and accentuates their natural sweetness. Grapes are roasted along with the sprouts, so they coat the sprouts with their winey juices and lend more sweetness. A good shellacking of pomegranate balsamic vinegar towards the end of the roasting provides a lip smacking caramelized finish. Finally, the sprouts, grapes, and juices are tossed with farro and toasted walnuts, creating a rustic and satisfying dish, which is nutty, sweet, and not too dense with sprouts – but with just enough to satisfy the lovers and appease the haters at your dinner table. So give it a try and let me know. Pomegranate balsamic vinegar is available in specialty stores and well-stocked supermarkets. You can make your own by whisking together 2 tablespoons balsamic vinegar and 2 tablespoons pomegranate molasses. Preheat the oven to 425°F/220°C. Toss the Brussels sprouts, grapes, thyme sprigs, oil, salt, and pepper in a large bowl. Spread on a rimmed baking sheet and roast for 15 minutes. Remove from the oven, drizzle the pomegranate balsamic vinegar over and stir to coat. Return the baking sheet to the oven and roast until the sprouts are tender and the grapes have begun to shrivel, about 15 more minutes. Remove from the oven, discard the thyme sprigs, and transfer to a serving bowl. Add the farro and walnuts and toss to combine. Serve warm or at room temperature. In a matter of a few weeks our farmers market has transformed into the vegetarian equivalent of a candy store. New leaves, baby shoots and spring bulbs are on display in miniature form as their growing season is in full force. In general, I like my veggies cooked simply, and at this time of year their freshness demands it. All that’s needed is a quick steam, saute, or a turn on the grill and you will have a simple and delicious side to any meal. 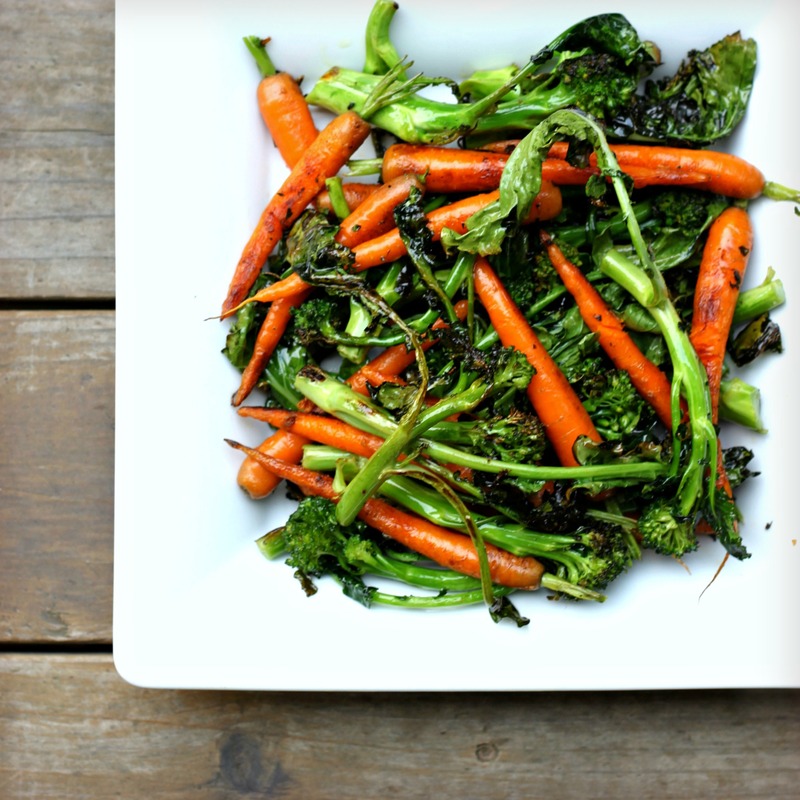 Broccoli and carrots pretty much sum up the ingredient list for this veggie side I made recently – plus a pinch salt and splash of olive oil for good measure. Everything converged on the grill, which in itself is another ingredient to the dish, adding char to complete the flavor profile. On the grill? Yes, if you are careful and lay the vegetables perpendicular to the grates to prevent them from slipping through. Better yet, if you have a cast iron skillet (which you should), preheat the skillet (or a griddle) on the grill, then sear the vegetables until they wilt and char, and you are good to go. Vegetables simply never tasted so good. 1. Prepare a grill for direct cooking over medium-high heat. If using a skillet or griddle, preheat on the grill for 10 minutes. 2. Place the vegetables in a large bowl. Drizzle with 1 to 2 tablespoons oil – just enough to coat without soaking – and lightly season with salt, then turn to coat. 3. Lay the vegetables perpendicular to the grill grates (or spread in the skillet) and cook until bright in color, crisp-tender, and lightly charred, turning as needed, about 5 minutes, depending on thickness of the stalks. 4. Transfer to a serving bowl and season with additional salt and black pepper, if desired. Serve warm. 5. Other options: sprinkle crushed red pepper flakes over for a nice bite and drizzle with a squeeze of fresh lemon juice before serving. This brussels sprouts recipe is perfect for the holiday table. Roasted grapes and a shellacking of caramelized pomegranate balsamic vinegar tame and complement the earthy crucifers. Farro and toasted walnuts add heft and heartiness to this side dish, while nicely providing a satisfying vegetarian option on a meat laden table. If you can’t find pomegranate balsamic vinegar, you can make your own by whisking together 2 tablespoons balsamic vinegar and 2 tablespoons pomegranate molasses. Serves 4 to 6 as a side dish. Preheat the oven to 425°F. Toss the brussels sprouts, grapes, oil, salt, and pepper in a large bowl. Spread on a rimmed baking sheet and roast 15 minutes. Remove from the oven and drizzle the pomegranate balsamic vinegar over, stirring to coat. Return to the oven and roast until the sprouts are tender and the grapes have begun to shrivel, about 15 minutes more, stirring once or twice. Transfer to a serving bowl. Add the farro and walnuts and toss to combine. Add more salt and pepper to taste. Serve warm or at room temperature. Sometimes it’s necessary to state the obvious. These roasted potatoes are a standard accompaniment to meat and fish. They may be predictable, but they are also a classy reflection of simplicity. The ingredients are minimal (it’s all about the potato) and the method is easy (toss and roast). The results are, well, obvious: delicious crispy, salt-tinged potatoes. That’s the kind of predictability I will rely on any day of the week. Salt the potatoes just before roasting to prevent them from exuding water. Preheat the oven to 425°F. Quarter the potatoes (or halve if very small) and place in a large bowl with the garlic. Drizzle the oil over the potatoes and toss to coat. Season with salt and pepper and toss again. Dump the potatoes onto a rimmed baking sheet and spread evenly. Scatter the thyme sprigs around the potatoes. Place the baking tray on the lowest rack in the oven and bake 30 minutes without disturbing. Move the baking tray to the top half of the oven and continue to bake until tender and golden, 20 to 30 minutes more. Remove and transfer the potatoes to a bowl. Pour in an extra glugg of oil and stir to coat. Garnish with additional sea salt and fresh snipped thyme leaves. Root vegetables are sadly underrated. The lowly unsung root is, in fact, a storehouse of nutrients, natural sugars, and starch, and a very healthy and flavorful substitute for the ubiquitous russet potato. It’s also a delicious and simple way to get your daily dose of vitamins during the cold weather season. A peel of the skin reveals a rainbow of anti-oxidant-rich colors ranging from magenta to ochre to buttery yellow, guaranteed to brighten a gray day – and your holiday table. 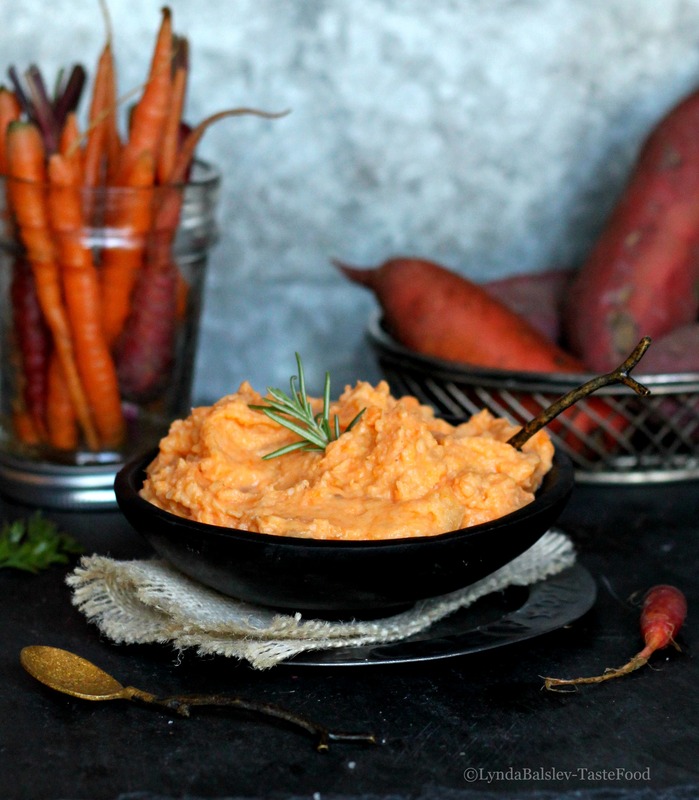 I used sweet potato, celery root and rutabaga for this mash. You can add other roots, such as parsnip, carrot, and the handy russet potato to the mix as well. Be sure to choose a variety for a balance of sweetness and nutty creamy flavor. I use a combo of sour cream and Greek yogurt in this mash, which creates a little naughty richness and a little tangy lightness. So long as you use a combined amount of 1 cup, you can opt for all of one or the other. Peel the root vegetables and cut into 1-inch chunks. Place the vegetables in a large pot with 2 teaspoons salt and cover with cold water. Bring to a boil over high heat, then reduce the heat to medium and simmer until the vegetables are very tender. Drain the vegetables and return them to the pot; cool 5 minutes. Add the garlic, butter, sour cream, and yogurt. Smash with a potato masher until the ingredients are blended and the the mash is your desired consistency (I like mine a little chunky). Add salt to your taste and a generous amount of pepper. Spoon into a serving bowl and serve warm. The mash may be prepared up to 1 day in advance of serving. Cool completely and transfer to a buttered, deep gratin dish. Cover and refrigerate for up to 24 hours. Remove from them refrigerator 1 hour before serving. To reheat, heat the oven to 325°F. Dot the top of the mash with about 1 tablespoon of diced butter and cover with foil. Bake in the oven until heated through, 30 to 40 minutes. Can you ever get tired of potatoes? No, you firmly say, and I would agree. Sometimes, however, a fluffy-creamy-comforting side dish is called for, and potatoes (shocker) just don’t do the trick. Usually it’s simply a menu issue, meaning potatoes are not a perfect match to the entree. Think shellfish, for instance, such as scallops or shrimp. Or a cuisine that doesn’t traditionally include potatoes. Step in, caulflower. There’s something a little magical about this gnarly crucifer. Eaten raw, its flavor is pronounced in an earthy, grassy, unmistakably cruciferous way. When steamed, it transforms into something else, morphing into a buttery, milder version of itself – slightly sweet, a little fresh, and beautifully enhanced with, yes, butter. When roasted, it becomes something else entirely, evoking adjectives which include caramelized, nutty, crisp, and addictive. I made this puree recently to accompany a dinner of slow-cooked lamb. It goes equally well with just about anything. The chicken stock adds great flavor to the purée. If you prefer a vegetarian version, substitute vegetable stock. Alternatively, you can use water, but adjust the seasoning accordingly. Makes about 2 1/2 cups. Place the cauliflower and chicken stock in a large pot. Bring the stock to a boil then reduce the heat and simmer until the cauliflower is very tender, about 20 minutes. With a slotted spoon, transfer the cauliflower to the bowl of a food processor. Add 1/4 cup of the chicken stock and process until smooth. Add the cheese, butter, garlic, salt, and pepper and process to blend. If the purée is too thick, thin with additional spoonfuls of the stock to your desired consistency. Serve garnished with fresh thyme leaves and extra black pepper.